Each Sunday on CookingManager.Com I cover a different appliance or piece of kitchen equipment. Many people believe that pressure cookers are only good for one particular item. My mother used hers for tongue and corn on the cob. But pressure cookers can be used for just about everything normally made in a pot including vegetables, soups, beans, sauces, grains and meats. You can even use them for cheese cakes or puddings. Pressure cookers create a lot of noise and steam, which can be intimidating. Steam would force the valve from my mother’s pot onto the floor. Newer models are safer and easier to use. Since I bought a pressure cooker a few years ago I use it more than any of my other pots. 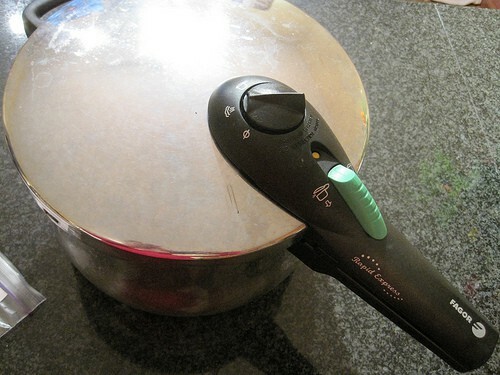 Pressure cookers work using an ordinary gas or electric burner. Electric models are also available. It can be an expensive outlay, but the reduced cooking times make it worthwhile. The longer the item needs to be cooked, the more you save so it is great for dried beans and tough meats. The pressure cooker retains the flavors, vitamins and colors of your food. Pressure cookers have some parts that need to be replaced every few years. Check your manual as there are wide variations among models. Put the food into the pot. You may want to saute onions first. Add water, but not as much as you need for a conventional pot. Check your instruction manual for specific guidelines. Be careful to leave extra space for rice, barley and legumes, which generate large amounts of foam. Put the cover on tightly by sealing the lever or valve. Turn the gas or electric burner under the pot on its highest setting. Pay attention to the noise. When enough steam has accumulated inside, the pressure cooker will begin hissing insistently. Lower the gas. You may want to switch to a smaller burner to save gas and prevent scorching, but be sure that the proper pressure is maintained. You can tell by the hissing, or momentarily lifting the valve to release a bit of steam. Set the timer for a third of the conventional cooking time. For brown rice or large potato quarters, I use about ten minutes. Because food cooks quickly, a minute can make a difference. Natural release: For sauces or soups when the cooking time isn’t critical, and for items that foam. Just turn off the gas and let the pressure cooker cool down slowly. Timed release: Most of the time you will use this method. The pressure cooker has a valve or lever that needs to be opened. Use a pot holder or glove until you are comfortable, but with today’s cookers this should not be necessary. Be prepared for a loud noise as the steam gets released, and keep your face far away. Cold release: When cooking time is crucial, like for spinach or delicate vegetables. Bring the pressure cooker to the sink and splash the lid—but not the valve—with cold water to cool it down quickly. Be sure the steam has been released before opening the cover. The instructions for mine say 15 minutes after a timed release, but five is usually enough. Never force the cover open. Some foods need to cook less time than others. To add food in the middle of cooking, use either the natural release or the timed release methods from Step 8. When you can safely open the cooker, add the food and repeat steps 3 to 7. Carefully remove the cover from the pot and check food for doneness. If not you can repeat the pressure cooking process, or continue cooking without pressure until it tests done. This seem more complicated and time-consuming than it is. Once you get the hang of it, you will find yourself using your pressure cooker more and more frequently. I use my large one to make several meals’ worth of potatoes, a large batch of soup or marinara sauce to serve and freeze in portions, and for cooked beans to have on hand for various recipes. For detailed information about pressure cookers, along with recipes, see Miss Vickie’s site. I’ve been using mine for about 12 years. A coworker had a pressure cooker in an unopened package and offered it to me when I happened to mention I would like to try one. I used to use it for bean soups, but I use the pot for meat and I like to serve those soups with dairy meals. Now I mostly use it for chicken soup. It’s amazing that you can make a pot of chicken soup for Shabbos dinner in 45 minutes from start to finish. I agree – we use our pressure cooker all the time for EVERYTHING. It is the best and most used pot in our kitchen. My sister-in-law got 2 pressure cookers as gifts when she got married, and gave one to us. I wasn’t sure how much I’d use it, but it turns out that I really like it- especially for beans. So quick and easy! I am considering buying a pressure cooker/canner.. Is that a good idea if I also want to make jams and pickles etc? I haven’t tried it but a quick search on the web yielded many pressure cooker recipes for pickles and jams. I found a lot also. I just have to figure out which one. Look for my answer for this Sunday. I just came home from the US with mine.. I can’t wait to get started! We use our pressure cooker all the time for beans and soups containing beans. We use it most days of the week it seems….. I have 2 pressure cookers, one is from 1948 and is my fav. It you inherit an older model, I have found they work differently than the newer ones. You do not start with the high heat. You start at say 3 or 4 on an electric range and turn it down after the pressure is reached. NJB, thanks for sharing that tip. It would be best to google the exact cooker of course, which is how I found out it was made in 1948. I had tried the high heat method till it comes up to pressure but it never would get the pressure, it just steamed. Then I remembered my mother telling me a decade ago I had the heat too high. Worked like a charm. I really love pressure cookers, they save so much time and energy. NJB, how is it when you release the pressure? You know since it takes such a low heat to come up to pressure, it takes longer, but this particular model has the 5/1015 pound setting–my newer one only has the 10 pound setting–so, for instance, lentils or mashed potatos, by the time it comes up to 5 pounds, I just turn it off. By the time the pressure goes down and I remove the valve, its done. I’m guessing the cooking time at pressure might be shorter because the pressure was slowly building all along. I can’t remember ever having to cook anything longer that 15 mins to get a huge head start. Probably why its my favorite. Now I see–you let it cool off gradually, and adjust the time to allow that. Reducing the pressure seems to be the issue with older models.